Burglary season is in full swing. At this time of year the extent of our worries ought to be getting work finished up before Christmas, making sure we’ve finished off the Christmas shopping, who’s drawing the short straw for going out to get the sprouts on Christmas Eve and wondering whether the new party frock will still fit come New Year’s Eve! 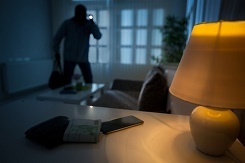 One thing that is not usually on the list is burglary – however, it should be. This Express article published this week writes about how burglary season is in full swing right now and they are enjoying every minute. We’ve already written at length about burglary increasing at this time of year but it would seem that Christmas Day and New Year’s Eve are peak dates for break ins. Probably because that’s when people are most distracted. It would take a particular kind of low life to steal from people on Christmas Day but burglars are not generally known for their compassion. It would seem that people don’t really help themselves though either. We’re all looking for clever hiding places for gifts before the big day, away from prying eyes, with many opting to stash things in the garage or shed, particularly large (expensive) items such as bikes. Sheds and out buildings are also being used as ‘safe places’ for deliveries. With so many of us shopping online and not necessarily in to take deliveries, we’re designating places for parcels to be left in our absence. However, how safe are these safe places? If the postman can access it so can a thief. If you don’t want to be victim to a burglary over the festive period then please make sure your home security is up to scratch. Make sure doors and windows are kept closed and locked and if you have a burglar alarm, set it. Pay particular attention to garages and sheds, as these are often overlooked. You can secure these with locks and add them onto your home alarm system. Instruct deliveries to be left with a neighbour or go pick it up from a sorting office/click and collect pick up point rather than have parcels left somewhere unattended and generally try to keep gifts out of sight (even if wrapped up). Don’t let the burglars have a better Christmas than you!